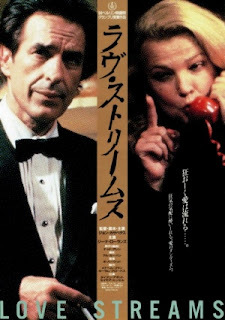 Cassavetes’ swan song (‘86s Big Trouble doesn’t count), is this odd tale of two siblings who are unable to form lasting relationships. Robert (Cassavetes) is an alcoholic author who pays to have women around him. Sarah (Gena Rowlands) is just stumbling out of a broken marriage and is all sorts of wrong. She's cracking up, but Rowlands plays her straight and makes her feel real rather than a caricature. Bizarrely Love Streams was financed by Cannon Films in a bid to show that they could make quality fare alongside their usual Chuck Norris flicks. If you like Cassavetes’ films then there is plenty here to love, not least the last time he and his wife (Gena) would act together. Gena steals the show while John looks incredibly ill. He died less than five years later. One for Cassavetes fans only.